Martha writes to Miss Campbell regarding her letter and the birth control problem. She mentions that one can not openly preach its doctrine lest they would drive many of the families that come to the school off due to the bitter opposition in the churches. 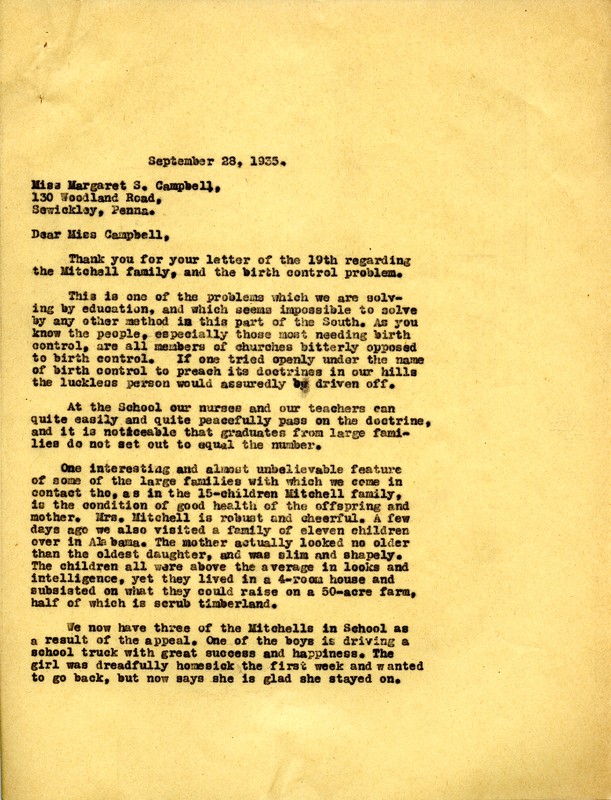 Miss Martha Berry, “Letter to Margaret Campbell from Martha Berry.” Martha Berry Digital Archive. Eds. Schlitz, Stephanie A., Jordan Brannen, Aaron Jackson, Jessica Hornbuckle, et al. Mount Berry: Berry College, 2016. accessed April 23, 2019, https://mbda.berry.edu/items/show/14197.